The New Zealand boatbuilding scene has many stories of successful brands that started with one man and an idea in his workshop. With encouragement the idea is nurtured from prototype to full-blown production. Seahull is just such a story, and we’ll be hearing a lot more from them soon. Designer and owner Stephen Sneddon had been building aluminium boats for many years. Each time he built one he considered that there must be a more efficient way to produce the basic hull, while still allowing for individual customisation. Roto-moulded polyethylene seemed to be the answer, since it had many of the benefits of aluminium (tough and durable, easy to clean and simple to repair) with none of the disadvantages of fibreglass (delicate gel coat, delamination issues, weight). The moulding process would allow for rapid production while offering considerable cost benefits over many other materials. In terms of design, Sneddon wanted a safe boat that was double-skinned, with high sides and a soft, dry ride. He looked at other models on the market, but nothing matched his criteria, so he set about designing his ideal boat. He says there was no compromise on the design as "most moulded plastic boats I've seen appear to be designed for easy moulding and looks, rather than for sea going performance." He has put a lot of thought into the design to create a sea-worthy hull capable of handling good seas, with hulls that are deep vee and well chined. The result reduces spray for that soft, dry ride Sneddon was looking for. The basic design of the Seahull is a catamaran, with asymmetric hulls either side. A small skeg down the centre provides a pod to protect the outboard and reduces spray-back under speed. Moulded blocks in the front corners provide simple seating points, while the centre section of the straight bow is shaped as a ramp for easy access to the boat. The central flat deck area is a huge 1.5m by 3.0m. The deck is well supported and can be covered with rubber, carpet, plywood or aluminium tread-plate. The hull is just a shade under 4m in length, with a beam of 1.9m and a height of 800mm. Sneddon explains why he chose a 3.9-metre hull to launch the range. "It's a good size for one person to handle," he says, "as well as providing extremely economical boating." A further benefit is that this size allows up to 12 boats (with packing) to be stacked into a 40-foot container; an important consideration for the export market. The plastic of the hull is between 6mm and 8mm in thickness, is UV resistant, impervious to damage by water or chemicals and is virtually indestructible. In the unlikely event that the hull does get damaged it can be repaired using plastic welding techniques, and about the only way to destroy this material is by fire. The bow ramp can be left as an integral part of the hull – as it was in our review boat – or it can be cut through and hinged to provide a roll-on ramp for heavy loads. 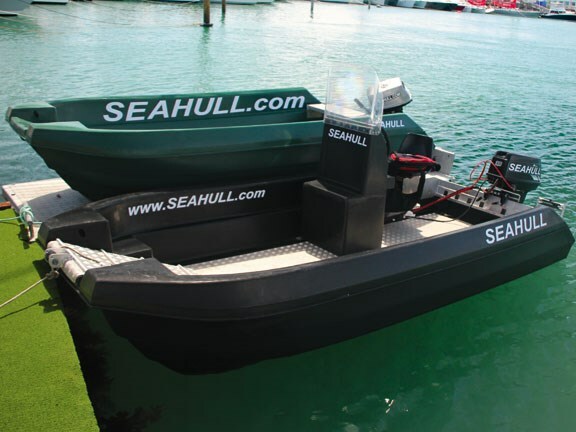 This makes the Seahull 4.0 a very functional work boat, and loads too heavy to lift can be wheeled on board. The hull has a rated load capacity of 600kg, which is substantially more than most 4m boats. This ramp section can be widened to the full floor width for a quad bike and is also wide enough to allow wheelchair access, making it the only boat of this size suitable for disabled use. The hull is double-skinned and is moulded in one piece. There is an option to fill the internal space with foam if the boat needs to go in survey for commercial use. Hatches may be added to utilise the internal cavity. An inspection vent allows access to the bilge cavity, unless the foam-filled option is chosen. The deck is slightly above water when normally loaded and the cockpit is self-draining. Scuppers in each corner have covers which can be closed up to avoid water seeping in if the boat happens to be heavily loaded. Although a fairly simple layout, there are several options available. A standard tiller-steer is the most straightforward solution, and for this configuration an aluminium bench-seat is fitted across the stern of the boat. An aluminium tread-plate deck is usually fitted along the length of the deck to ensure a non-slip surface even when the interior is wet, as well as provide a tough surface for dragging heavy loads on board. Another configuration option is a console layout, and this could be a centre console or the offset console that we tested. The buoyancy of the hulls means the boat remains level even with the weight of one person sitting on the side, and this option opens up the maximum load area in the cockpit. This configuration is likely to find favour as a work boat, although a conventional centre console may be more popular among recreational users. The console unit and seat are also both polyethylene mouldings, with some additional aluminium bracing under the seat. A third configuration option is a cuddy cabin top that Sneddon is currently developing with an associate. This will sit flush with the gunwales, enclosing the front third of the hull. Sneddon says that a scissor support bracket arrangement will enable this unit to be raised up as a T-top roof while at rest, or dropped down to the cuddy position to provide spray protection when underway. For all layouts except the tiller option, steering is by conventional cable and the motor is mounted on a sturdy aluminium transom reinforcement. 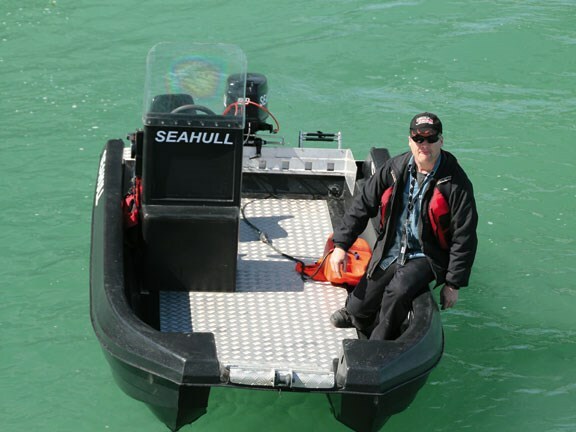 The review boat had a low-cost Seahull-imported 30hp two-stroke motor, although Sneddon will happily fit whatever make or model outboard the purchaser prefers. Fuel is provided through tote tanks, with space up against the transom for a couple of these. The helm console has a plastic windshield to keep spray and wind out of the skipper's face. This seemed to be an adequate size, although during our run we didn't test its limits since we took no spray on board. The console has a large dry cubby space with an alloy hatch, and this is large enough for a spare tote tank. The battery is mounted under the skipper's seat on a custom alloy bracket that lifts it well off the deck. The review boat had no instruments or electronics fitted, but there is plenty of space on the dash for a chart-plotter, VHF radio and engine gauges. A VHF antenna could be mounted to the side of the console unit, and navigation lights can similarly be mounted on either side. Sneddon says that the design of his moulds allows him to cast inserts into the hull space, and he can create sealed cubby-holes, toe-recesses and the like into the sides. The basic model includes four rod holders, one in each corner of the bow and stern areas, and grab handles fitted to both sides on the stern. 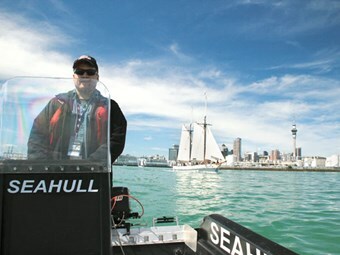 We had a chance to test out the boat during the recent Auckland International Boat Show, and slipped away from the dock during a quiet period. Out in the choppy Waitemata Harbour the boat showed its capability, easily handling the inner harbour conditions. The Seahull 4.0 certainly proved capable, with the tough little 30hp motor getting the boat with two passengers aboard up into the twenty-knot plus region. The hull is rated up to 60hp, so for work-boats carrying heavier loads a bigger powerplant could feasibly be fitted. The boat turns well, with little of the outward camber that some catamaran hulls suffer from. During the photo session, when the boat had just one person on board on the starboard side, the hull still tracked level. There was little lean despite the uneven load. At rest we both leaned over the same side and again there was excellent stability, largely due to the asymmetric hull design. The ruggedness of this boat was well demonstrated during our test on the water. We spotted a large fence post floating in the harbour and, from the look of the slime and growth on this, it had been there for some time. In a fibreglass or even alloy boat, we would have steered well clear of this obstacle. However with the Seahull we nosed up to it and easily dragged it aboard over the bow ramp. We then headed out to the boat ramp at Stoke Point where, despite the rough concrete and numerous rock oysters, we simply nosed up the ramp and offloaded the post well above the high-water mark. 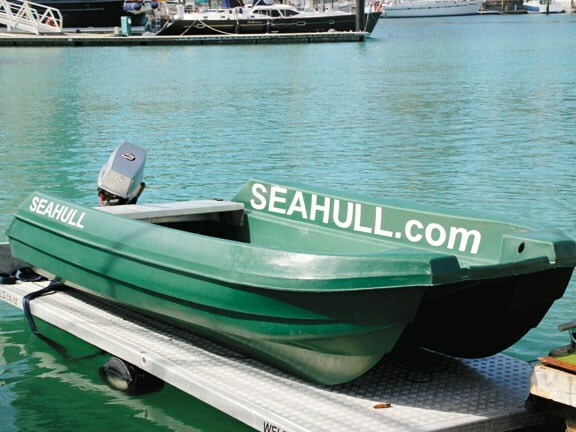 Sneddon provides several trailer options for the Sea Hull. If total package cost is an issue there is a budget trailer option too. For a slight premium a flat deck is welded to the trailer framework, enabling the trailer to serve double-duty as a general utility trailer. The hull weighs a mere 200kg and is light and tough enough to simply offload onto the ground when the trailer is required elsewhere. It can easily be winched back once the trailer has finished other duties. Sneddon even makes an optional (and totally unique) floating aluminium trailer, which he had on show at the Auckland Boat Show. Sneddon has sold boats to some well-known New Zealanders', as a close examination of the pictures on the Seahull website will show. They also supply boats to a company that specialises in electrically-powered yacht tenders. By fitting electric motors into the hulls, and solar panels to the cuddy cabin top, they have an environmentally-friendly option that costs nothing to operate while also being a pollution-free and silent runner. This is not a luxury boat and certainly won't be used for venturing far offshore. 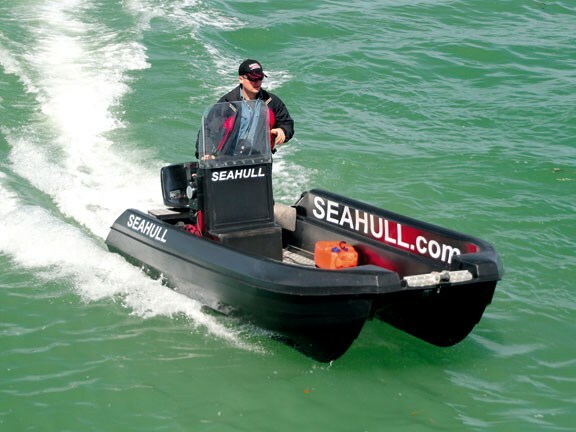 But if you're considering a small inshore boat for fishing, set-netting, scalloping or for work purposes, then the Seahull 4.0 should be first on your list for a trial run. The added bonus of being able to transport large loads, and especially wheelchairs and other disability aids, makes this a unique proposition. Prices start at $6000 for a bare hull. The complete package as tested with 30hp outboard motor and offset console is $13,500. For more details ph Steve Sneddon on 09 622 1041, or visit seahull.com. Seahull are also looking for national and international distributors.